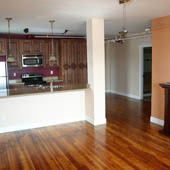 Includes a living room with hardwood floors and brick wall accents. Great views. Just remodeled. 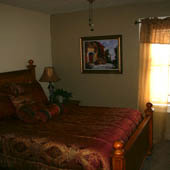 Excellent downtown location with easy access. Secured building, attentive building management. 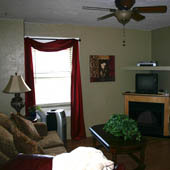 Two bedrooms and 1 bath, large living room and dining room with fir hardwood floors. 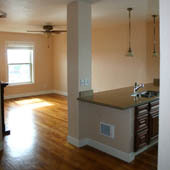 New kitchen with large granite countertops, kitchen cabinets, stainless steel appliances, fireplace. Top floors with great views from every window. Excellent downtown location with easy access. Secured building, High speed access available, attentive building management.